I don't often post these reviews in the order that I review them, so you'll just have to take my word for it that I've been on a big Special K binge lately since they've been introducing so many new products. It seems like I've been eating them like crazy and I've still got more in my cabinets at home to knock out as well. 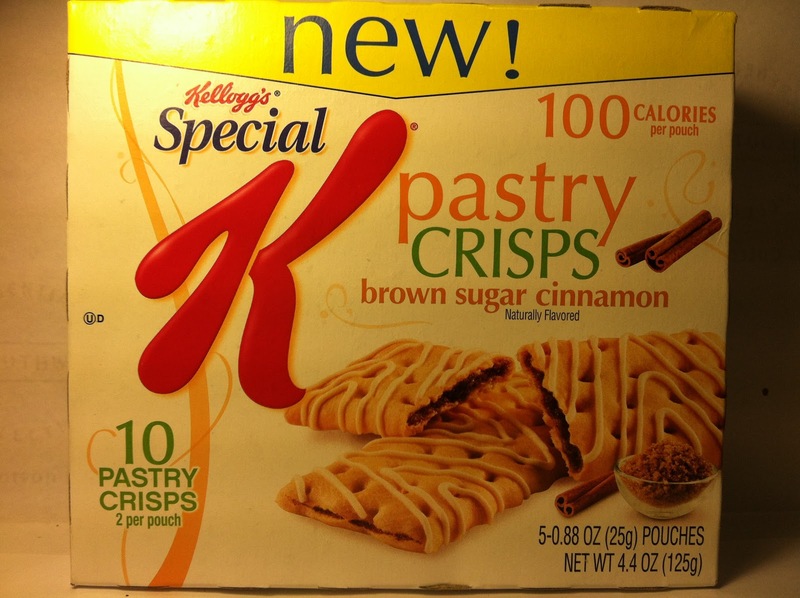 So, with that binge, I'm led to this review of the Kellogg's Special K Brown Sugar Cinnamon Pastry Crisps. I picked up these "treats" at Meijer for around $2.50 for a box of ten. Well, there's ten crisps spread into five pouch, so obviously there's two crisps per pouch. Yep, that's me, Crazy Food Mathematician Dude. 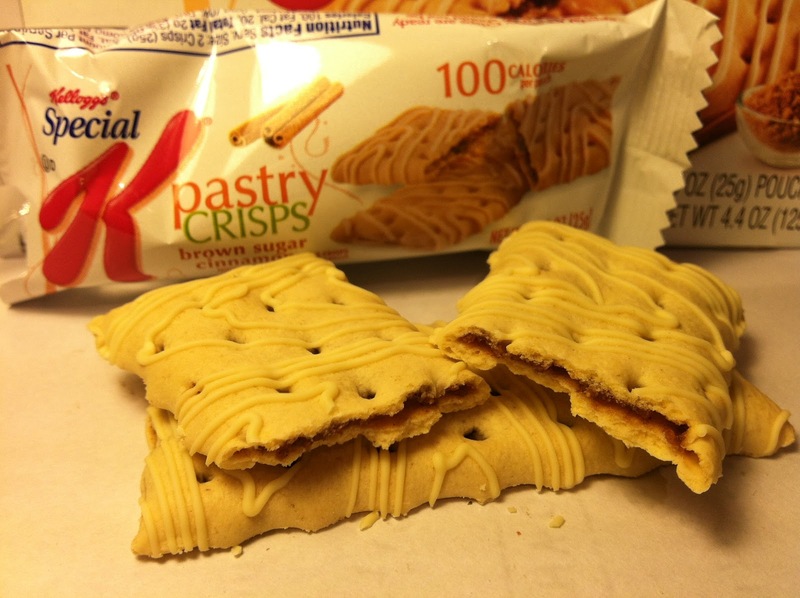 Each package of two is 0.88 ounces and 100 calories, so to do some more math, each crisp is 0.44 ounces and 50 calories. Yep, I'm a regular John Nash. Clearly there's no mystery here since there's a picture of the product on the box (Special K is good about that), but I'll go through the description anyway. What I got here is an especially light and flimsy rectangular product that was carrying on a baked, cracker-like motif with aeration holes and the like throughout the crisp. The "dough" part of the crisp was then dusted with a light bit of cinnamon and topped with a thin vanilla icing swirl. Inside of the crisp was a cinnamon and brown sugar mix that smelled of both of those scents, but wasn't particularly overpowering in either way. In fact, it smelled like a cinnamon roll and I, like most gluttonous Americans, deeply loves cinnamon rolls, so that scent was quite a turn on for me. Biting into the bar, I was met with a slight cinnamon roll-like taste, but the crisp portion added a brittle flakiness and slight crunch to it. The vanilla swirl taste on top was virtually undetectable, but the brown sugar and cinnamon did provide the cinnamon roll-like taste that I previously mentioned. The dough itself was bland and actually kind of reminded me of a cereal bar or something of the like, except in a more flimsy form. Still, the interior mix of the brown sugar and cinnamon is what made this a delight as it did a reasonable enough approximation of a cinnamon roll that it left me wanting more and more after I finished my 0.88 ounces. Buy It or Fly By It? I have to give it a BUY IT rating. I could eat these all day long and I can't say it is because I loved them so much or if it was because they were so tiny (it was probably a bit of both), but I do know I loved this either way. If you are looking for an extremely light snack reminiscent of a cinnamon roll, give these a chance and I think you'll be quite happy with the results. Kellogs are my favorite ingredient for my specialty: Crunchy Caramel Bars. You can also consider rice crunchies. I learned that during my cake decorating classes.